Doss Industries is the parent company to several San Francisco Bay Area companies including the Burlingame Museum of PEZ Memorabilia, the Banned Toy Museum, the Classic Toy Museum and Character Favorites. 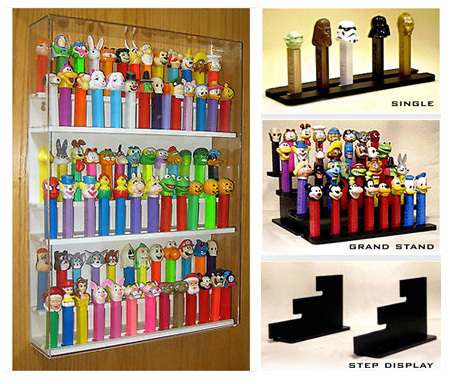 For over 14 years, we have manufactured and sold display systems for Pez candy dispensers. We have integrated our years of experience manufacturing these quality display systems to create the BRICK RACK Display System for LEGO Minifigures, sets and creations. An icon of American pop culture, PEZ has been dispensing fun and candy for over 60 years! have been produced since 1950. See them all at the Burlingame Museum of PEZ Memorabilia. Our gift shop has an exceptional selection of new, vintage and European Pez dispensers. Celebrating our 17th year! LEGO and an Easy Bake Oven. Recent additions include a 1959 #1 Barbie doll, and a 1934 issue of "Famous Funnies," the first modern comic book. Toys have been pulled off store shelves for a variety of reasons.Some were very dangerous, and some were politically incorrect. The Banned Toy Museum features many of these toys, including the Atomic Energy Laboratory, Lawn Darts, and the "potty mouth" talking Po doll. Our goal is to educate and to entertain you with toys you can't play with anymore!